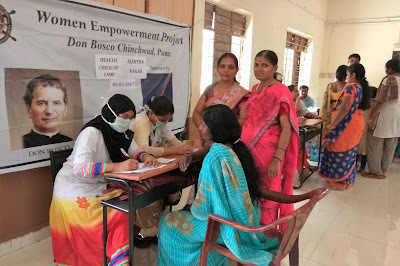 Chinchwad (Pune) - 5th May 2017: The Don Bosco Development Society (DBDS) Chinchwad organized a free health camp under t he ‘Women Empowerment Project’ supported by AXA Business Services. 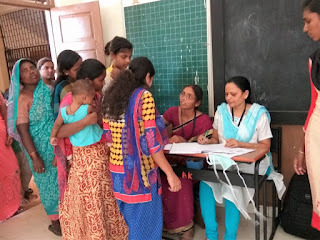 183 underprivileged women and children were examined by a team of doctors and para-medic staff from Aundh hospital. 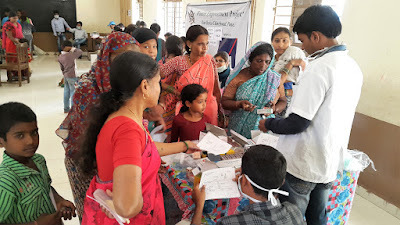 The health camp was held in Vidya Nagar slum in Chinchwad. All the beneficiaries were from poor and needy families who can’t afford private health care services. Dr. Suraj Gaikwad – (Physician), Dr. Deshpande (Paediatricians), Dr. Mane (ophthalmologist) and Dr. A.L. 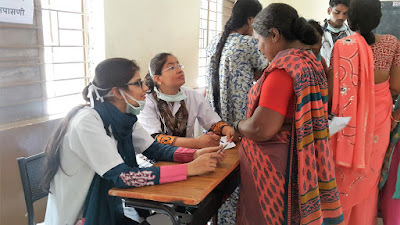 Doshi (ophthalmologist) along with 12 Nurses, one medical Social worker, 5 Lab technician and 2 MPW examined the patients in this health camp. Ms Vibhawari Kamble (social worker - DBDS) expressed her opinion that “our effort is to improve the health indicators and environment in the slum communities under this project.” Ms Lalita Choudhary (Co-ordinator - DBDS) expressed that “no major illnesses were found but there are cases of anaemia, cough, cold, migraine, GRDS, worms in children, joint s pain, low HB etc. Free medicines were distributed and people with serious illness were referred to Aundh hospital for further treatment.